Math students add and multiply fractions in Common Core fifth grade. These skills require using and extending their knowledge of these operations from their earlier work with whole numbers. and — more generally — that adding fractions requires common denominators because you need to add same-sized units. The hard part about multiplying fractions isn’t the algorithm. It’s an easy algorithm: Just multiply the numerators and multiply the denominators. Students draw pictures to solve problems like in this figure that involve parts of parts. in the upper-right part of the diagram. 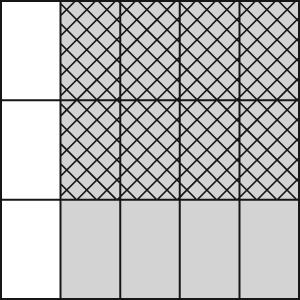 This product refers to a fraction of the original whole — the square in the figure.